…is this week’s photo. 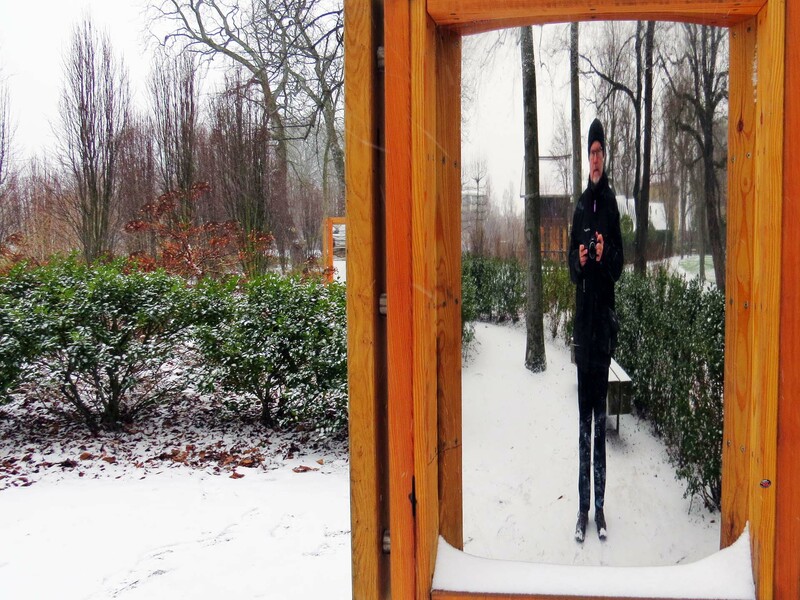 It shows a part of the Trädgårdsföreningen park (and the photographer) under snow, reflected in one of the distorting mirrors by the canal. Originally published 18 January 2014. What I like most about this picture is that the mirror makes me look relatively slim. Snow is good for winter photography in our northern dark. It increases the amount of light and makes for better contrast and more interesting images. Without snow (or sun), winter pictures from northern latitudes can be very dull. Of course you often don’t want snow and sun together. That can wipe out all the contrast and leave you with a bleached image. There’s no satisfying a photographer! But to be sure, the skilled photographer sees all these things as a challenge and can, with skill, pull some amazing pictures out of the camera. I’m not making that claim here. Just rambling on because my Search Engine Optimisation programme insists on Words! More words! Still, joking aside, I was pleased with the composition of this photo. It’s almost – almost – like you are looking at me through a window and the path curving away behind me, don’t you think?